Conor McGregor UFC memorabilia, signed, framed and ready for display, with a certificate of authenticity. Signed sports collectibles can do far more than help you remember. They can take you back there, helping you relive your favourite sporting moments in a personal way. Give this signed, framed piece of MMA UFC memorabilia pride of place in your collection. 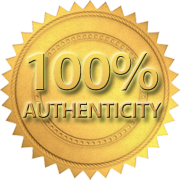 That's why each and every product we sell comes with its own certificate of authenticity.